The following below are few tips that explain on how to deal with office politics. One of the simplest ways to avoid politics at work is to maintain good relations with everyone. Though it doesn’t mean that you will need to be a pushover for other employees, there is no harm in being pleasant and assertive. Office politics is often a result of bias and partiality within the firm. When you maintain good relations with people in the organization, there are few chances that adverse effects of office politics may affect you. In case you have a concern, focus on the issue instead of the person. If you cannot fulfill a request, explain the reasons and come up with suitable solutions. Office or work politics is often a power game but it is never advisable to be a part of the same. Stay away from office politics. It is unhealthy and hampers your efficiency and work approach greatly. As any other employee, you will have certain objectives which are important. Yet, if they are not too time consuming, then you can be helpful to your co-workers. If you can help a colleague, you can win his trust and loyalty. By doing so, you will also reduce the chances of being a victim of political intrigue. Professional jealousy is a common tendency in most organizations. Most professional relationships are based on your usefulness and overall goodwill. 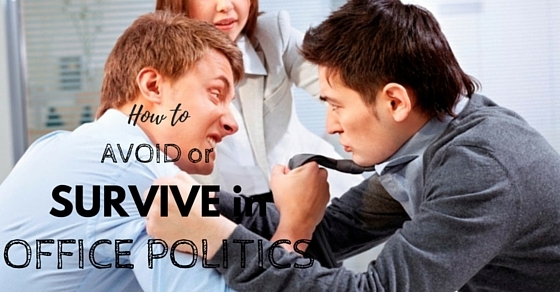 If you are able to retain the goodwill for you in the minds of people by your kind ways, it will sure protect you against politics in the workplace. If you have any organizational problems or people have confided about something to you, then keep them to yourself. Talking about these matters to outsiders within the company will create a negative impression about you in their minds. Bosses usually do not appreciate this type of behavior. Once people come to know that you have spoken about anything they have discussed with you, you will lose the trust and respect in their eyes. Very often, trivial issues mark the beginning of a major issue in office. Internal politics within an organization can never be erased completely but you can sure take steps to reduce it as far as possible. Do not join teams in gossips. Do not attack anyone personally in your professional life. Maintain a completely professional attitude if you wish to stay clear of office politics. The best way of dealing with office politics is to be a straightforward person who isn’t involved in office politics. Handle your day to day tasks, alert others about any issues and admit the mistakes you make. It will make your colleagues respect you, even if they disagree with your views. As a result, your chances of being a victim of office politics will also be reduced. Often people who stand pro or against a system stand a greater chance of being affected by office politics. On the contrary, people who stick to their core principles and are affected by the people in the system, are unaffected by politics and its adverse effects. You must surely raise voice if something wrong is going on. Stand up against wrong things but do not fight against a whole system. Gossips destroy the atmosphere of the office. As it doesn’t do anything good, you should stay away from it. But make it a point not to encourage others from refraining from gossip. Rather, you should change the topic. Changing the topic will help you distract the speaker in a subtle way without offending him. You may not always succeed in your goal of stopping a gossip through advice but changing the topic is always a helpful tactic. There may be situations in which you may find your colleagues complaining about your boss. Your involvement in the discussion will make you disloyal to him. If you don’t, it might look strange. This is a tricky situation and most people face such situations at some point of their career. There are a few approaches that may help. Under these circumstances, you can change the topic by linking your boss to other topics. You may just quit the group by making an excuse of getting fresh. This way, you will be out of the discussion and yet not look like the odd man out. Nothing can save your career in a better way than a written record. If you think an issue can trouble you later, then maintain a record in e-mail or document. Documentation will help you to record your accomplishments and help you gain good grades while your performance is evaluated. As human beings, we tend to forget things at some point of time. You need to be mentally prepared for any queries and doubts about any project you have handled. If you maintain such records, you needn’t worry about people hampering your reputation through politics and gossiping. People in your team who aspire to excel more than you or envy your success may try to ruin your reputation. They can do this by proving you have not done your work satisfactorily. If you maintain records of work you have done, you surely have proof to support your work and efficiency. If you believe that politics in workplace is a problem, then frankly reveal it. Tell people that you are not interested in politics and only want to get a work done. It may not be successful, but unless you speak about the issue, there’s no chance that people will believe you. In case a colleague is unavailable, then you will need to act on his behalf and convince him that you are doing so far greater good. When you raise the issue of office politics, everyone is not going to be pleased. You need to understand that there are many who benefit from office politics. You must handle this delicate issue wisely. Make sure no one feels offended or take the whole thing personally. If you are in a senior position, you need to keep a close eye on your incentives. Are you unconsciously setting your subordinates to work against one another? Do your metrics focus on specific departments, or do they also prove to be beneficial for other departments? For example, the operations department of your company reduces all its prices by half. If you calculate only the profitability of the operations department, you will find that it is performing poorly. However, the evaluation will neglect to take into account the increased volume across other departments due to the operations department. People within a company follow leaders to see how they take important decisions related to the business. Do you want your staff away from negative politics? Do you want people to coordinate and work as a team rather than indulge in petty personal rivalries and backstabbing? Act in a way you want your staff to. They will follow you. It is never too easy to be a leader. When you become the leader, everyone expects you to be perfect. You need to lead by example and this can only happen if you work efficiently. People should not be able to find any flaws in your working. Stay organised and make sure you give no one a chance to point fingers. If you get into office politics, you spend more time pleasing people than doing work. Office politics does not lead the efficient and hardworking men to success. It leads people who know to please powerful people to success. Innocent people can also fail bait to office politics. Being a part of it means you are also responsible for the harms of office politics. It only ruins the office environment and leads the wrong people to success. It is thus best to work hard and dissuade people around from being a part of office politics. Previous articleHow to Encourage Employees to Work Harder?